Each year Opera Guild members and their guests are invited to mix and mingle prior to the Tri-State College Vocal Competition. 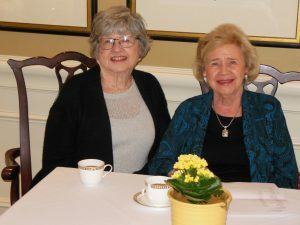 This year the Stars of Tomorrow Luncheon will be held at Moraine Country Club at 4075 Southern Boulevard on Sunday, April 7. The Social Hour begins at 11 a.m. followed by lunch at 11:45. 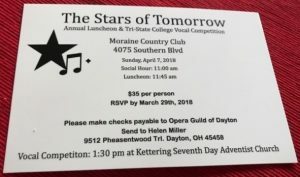 The cost of the Luncheon is $35 which should be sent to Helen Miller, 9512 Pheasantwood Trail, Centerville, Ohio 45458, by March 30. Make your check payable to Opera Guild of Dayton. Please advise Helen if you would like a vegetarian meal for the Luncheon. 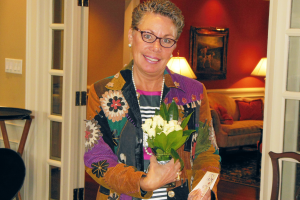 Contact Helen if you have questions at 937/885-4925 or daidocent@aol.com. Guests will move to the Kettering Seventh-Day Adventist Church located at the corner of Southern Boulevard and Stroop Road by 1:30 p.m. to hear the finalists compete in the Vocal Competition. There is no charge for attending the Vocal Competition. Below are photos from a previous year’s wonderful Stars of Tomorrow Luncheon.